A man wanted by police in Morecambe after an arson is still on the run. Scott Cardwell’s Facebook page has been updated since police issued an appeal for his whereabouts on Wednesday. A screenshot of Scott Cardwell's Facebook page which has been updated since police issued an appeal for his whereabouts. His cover photo now shows him with an unnamed woman in what appears to be a bar somewhere in Europe. It is unclear whether the picture is new or if Scott Cardwell has fled the country. Police stormed a caravan in Morecambe on Wednesday lunchtime looking for Scott Cardwell. 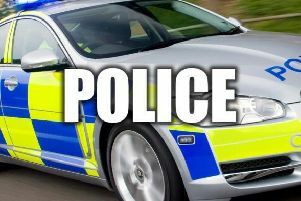 Two witnesses told the Lancaster Guardian they heard police yell “You’ve got one last chance!” before officers raided the caravan at the Regent caravan park. An officer with a sniffer dog also searched near the caravan where police believed a wanted man may have been hiding but the man was not there, according to witnesses. Officers want to speak to Scott Cardwell, 32, after an arson at an address on Kingsway in Heysham on Sunday. Members of the public are being warned not to approach Cardwell but to call police on 999 if they see him or know where he could be. Chief Supt Chris Bithell said: “We are actively trying to trace Scott Cardwell who is wanted in connection with an incident, which occurred shortly after 5pm on Sunday when a car was set alight. “We are keen to stress that our enquiries are continuing and while we do not believe there is any wider threat to the public at this point, I would urge anyone who sees Cardwell not to approach him but to contact police urgently. Anyone with information should contact police on 999 quoting log number 1015 of February 5.